How can I edit lyrics on my audio files? Home > How to use tips > How can I edit lyrics on my audio files? Click on the tab "Lyrics" or click the "Lyrics" button on the toolbar for open "Lyrics Editor". 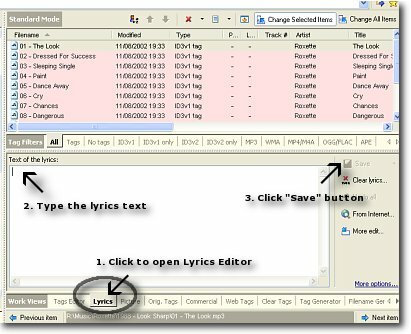 Type text of lyrics and press "Save" button (see Figure 1) for saving lyrics to the audio file. Attention! You must use ID3v2 tag for adding lyrics to your MP3 files. Hint: you can type different lyrics for different audio files and save all lyrics at once. You can add lyrics to the audio files without typing! 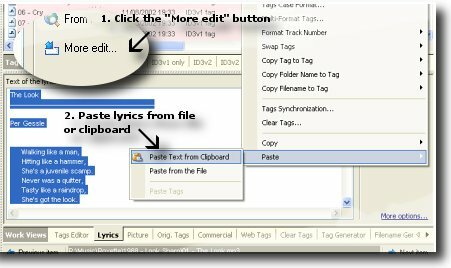 For this use the feature "Paste from the file" on the "Lyrics Editor" menu (see Figure 2). You can save existent lyrics to the text file or copy to clipboard. For this click the "More edit" button and select "Copy" menu item. You can clear all lyrics from your audio files. Select the necessary files on Selection List and click the "Clear lyrics" button. Press the "Save to Files" button for clear lyrics from the files. How can I edit artwork (cover art) on my audio files? How can I edit MP3 tag? How can I edit MP3 tag for multiple MP3 files? How can I add my MP3 files to the program? © April 29, 2008 by AssistantTools.com. All rights reserved. · How can I edit MP3 tag? · The advanced features for editing MP3 tags. · How can I edit lyrics on my audio files? · How can I edit artwork on my audio files? · How can I synchronize ID3v1 or ID3v2 tags? · How can I use tag filters? · How can I use ANSI characters on audio tags? · How can I use my national characters on audio tags (about UNICODE tags)? · How can I change WMA metadata? · How can I generate filename using tag information? · How can I generate tag from filename? · How can I generate tag from other tag? · How can I search of lyrics for my audio files? · How can I get tags from Internet? · How can I create M3U playlist with my MP3 files? · FreeDB support: receive tag information.